Ashley’s autobiographical work touts chess’ potential to interest kids in education and divert them from deleterious influences. Ranking near the pinnacle of professional chess, Ashley skims his career, emphasizing his teenage years in 1980s Brooklyn when he was lured into the 64-square universe of chess, saving him from a dangerous street life in Brooklyn. Anecdotes about the crazy pranks he and his friends pulled mark the road not taken. On his ascent to becoming an international grandmaster in 1999, the first black person to achieve the rank, Ashley evangelized chess in schools and coached a Harlem-based team, the Raging Rooks. It won a national championship in 1991, and the recollections of team alumni dispel common teen notions of chess as hard, slow, and uncool. While not overselling chess as a panacea for learning difficulties, Ashley’s enthusiasm and inherent role-model status give parents and educators valuable inspiration supported by practical information about organizing a school chess program. Below is a feedback we received from a young reader sent to us through email. I enjoyed reading these three sections, and I had a hard time putting this book down. I am inspired by Ashley, and his writing style is such a pleasure to read. The way he explains his life history helps provide greater context to issues I hear about every day. People in violent and/or drug infested areas are probably dealing with a lot of the same things he mentioned in the book. Despite not being in that mindset anymore, he was still able to provide an insider’s take on the way his environment lead to dangers and irresponsible behaviors he displayed before finding chess. Ashley (2005, p. 20) described the impact of the “three-headed monster that routinely ate up the potential of millions of kids” and gave me pause. Although it’s in the repeating moves section, I can see how that monster he described (skin color, neighborhood, and low expectations) could also be a trap for the kids affected by that monster. I don’t know anyone uplifted by a hobby or sport. I know people that have been in hobbies or sports since they were very small, and those interests provided a good path for them. My lack of exposure to that made reading this book even more interesting. 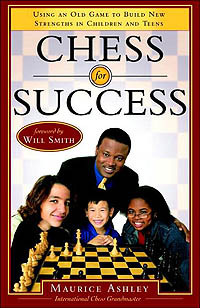 I was surprised by how quickly he took to chess, and how it touched every aspect of his life. It even affected how he picked his girlfriends. One of my two favorite parts of the reading was how each section header was a chess concept, and the content was about real life. Instead of just helping me understand how chess can be related to real life, it actually helped me understand chess a lot better. I’ve had a grasp on the real life side, but I didn’t have a handle on those terms until this reading. So far, as I’ve played chess, I’m just going from one movement to the next. I don’t have a clear strategy and I haven’t been able to understand how anyone can apply a clear strategy past a couple of moves. Typically, I’m just trying to keep up with identification of the pieces or remember which color I am (both are only needed when I play computer chess). Also, when I play I’m focused on one or two pieces. I don’t process what’s happening outside of those pieces of focus well. When reading his book, I was able to appreciate why openings, developments, and traps matter. How I already use or maneuver those things in real life, I just need to learn how to apply it to the chessboard. My other favorite thing about this book was his writing style. He provided such narrative to the game just by his word choice. I would reread sentences because they were mellifluous to digest. The feeling I had from his words about chess movements was almost identical to how I feel when I watch action movies. I absolutely love, love, love action films. I’m a pain to watch them with because I’ll rewind fight scenes numerous times. I reread his sentences for that same effect. Lines like “bishops slicing the board like blazing arrows, knights trampling the enemy underfoot, kings being ripped from their castles and dragged to the middle of the village square to face the executioner” (Ashley, 2005, p. 30) kept me just as excited as if I was reading one of my favorite comic books! I can’t be in a movie fight scene with Jason Statham, but I sure can be in an exciting battle on a chessboard. Reading about the action on the board gave me insight to how much fun it must have been for him as a young person reading skilled matches, and watching the chess games in the park. Read reviews & Grab a copy. Click on the images below.